Time for another smoothie bowl! You can have it for breakfast or as a post workout snack, either way it's delicious and super simple to make! Because I use quark in my smoothie it contains enough proteins to refuel my muscles after a workout, but if you eat it as breakfast these proteins make sure that your blood sugar levels remain stable which is a very important aspect of my philosophy on clean eating! You can read more about this on the following page: About Me & Clean Eating. Just mix the following ingredients in a blender until smooth and top it off with some homemade granola, hemp seeds and 2-3 pecans. If you like you can also add some mulberries. It's October and in the Netherlands this means that pumpkins are in season! So they are often on sale, or not as expensive as, say in July, and they are from the soil and not from a greenhouse meaning that there are even more vitamins present in the pumpkin because they are fresher. Also vegetables that are in season are less harmful to the environment because they are not imported from distant countries. Pumpkins are in season until January-February so in the upcoming months I will post more recipes with pumpkin! But first this delicious risotto based on a recipe of Jamie Oliver, but I simplified some things so it fits my lifestyle. Risotto is absolutely one of my favorite dishes but it always takes a lot of time to make it, especially since I use whole grain risotto, but it's worth it and once a while I just make the time to make risotto. Preheat your oven to 200 degrees of Celsius. Cut the pumpkin in half and remove the seeds. Cut the pumpkin lengthwise into slices half an inch thick. Remove the skin and cut into small cubes. Put these in a baking dish and mix with the chili powder and 1 tbs olive oil until everything is covered. Bake them in the oven for 35 minutes until soft. Meanwhile make the risotto. Heat up 1 liter water in your kettle and finely chop the white onion. Heat up the rest of the olive oil in a large pan, add the onion and the crushed garlic clove and bake for a couple of minutes on medium heat. Pick the rosemary leaves from the stalk, finely chop and add to the onion mixture together with the risotto rice. Bake for another minute, then add the glass of white wine, crumble over the chicken stock cube and keep stirring until the wine is completely absorbed. Season with salt and pepper and poor in one cup of boiling water. For the next 40 minutes keep stirring and when the water is almost absorb add some more but make sure you don't add to much. After about 30 minutes add the leaves of the sprig of thyme to the risotto and keep stirring! When the pumpkin has been in the oven for 35 minutes and is soft, put the slices of pancetta on top and add the pumpkin seeds to the baking dish. Add some salt and pepper to taste and put back in the oven for 10 minutes until the pancetta is crunchy. Now back to the risotto, when the risotto is nice and soft switch of the heat and stir in the piece of butter and 15 gr grated parmesan cheese and to taste some more pepper and salt. Put the lid on the pan and let it sit for 2 minutes to make sure that the risotto is nice and creamy. Stir in about half of the pumpkin cubes, put on a plate and top off with the pancetta and pumpkin seeds. You're absolutely delicious risotto is now ready to be eaten! Make sure you eat it straight away so you can taste the creamy texture. As you might have noticed you have some leftover pumpkin! Let it cool down and keep in your refrigerator until the next day so you can make a delicious pumpkin lunch salad! Sorry to all my readers outside the Netherlands but this will be the only post I will put up in Dutch because it's all about a Dutch event we are organizing! And I will prepare the lunch! So that's the reason I am promoting it on my blog! 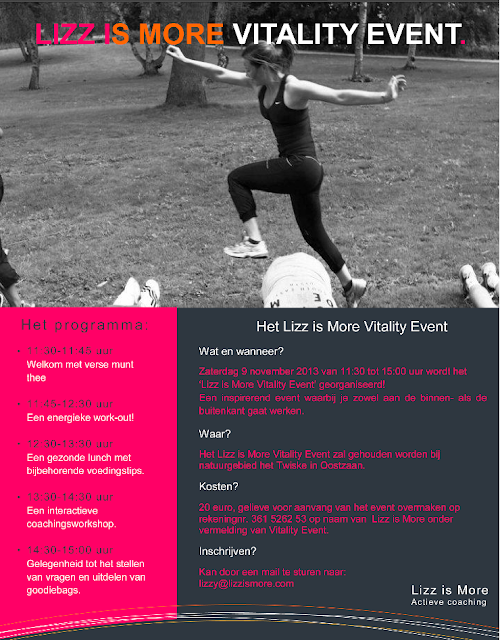 Op zaterdag 9 november van 11.30-15.00 vind het Lizz is More Vitality Event plaats in recreatie gebied het Twiske in Oostzaan (Noord-Holland)! Ben jij geïnteresseerd in actieve coaching en een gezonde leefstijl? Dan is dit event echt wat voor jou! Het event georganiseerd door Lizzy Posch uit Oostzaan. Zij is de eigenaresse van haar coaching praktijk Lizz is More en tijdens deze middag zal zij jullie kennis laten maken met bewegen als basis voor actieve coaching. Schrik niet, bewegen betekend niet gelijk bootcamp of kracht training wat ik zelf doe, maar beweging word gebruikt als coaching instrument om je mentaal en fysiek sterker te laten voelen en word aangepast op jou niveau en wensen! Je kan bijvoorbeeld denken aan wandelen, fietsen en hardlopen. Gedurende deze middag zullen we starten met een kopje verse muntthee en een energieke workout georganiseerd door I Move for Health. Daarna volgt er een gezonde lunch met voedingstips welke ik zal verzorgen samen met Zaripha. In de middag zullen jullie kennismaken met actieve coaching door middel van een interactieve workshop. Na afloop is er voldoende tijd voor vragen en ontvangen jullie een leuke en goed gevulde goodie bag! En dat alles voor slechts 20 euro! Vergeet ook niet je aan te melden voor het Facebook event: Facebook Event via deze link en nodig andere geïnteresseerden uit!! Just bought the new cooking book from Jamie Oliver: Save With Jamie! I love his books and recipes. They are such a great source of inspiration for me!! I always make my own tuna salad because I like to know what's in my food and store bought tuna salad contain lots of food additives. So I combined aspects of my tuna salad with the one from Jamie's new cooking book and it's amazing! And healthy! Chop the onion and pickle in small pieces. Put the onion in a small bowl with the white wine vinegar (to take away the strong onion flavor). Drain the tuna, mash in a bowl with a fork, add the onion and pickle and the quark and mix well. Add Salt and Pepper to taste. Put the slices of cucumber and lettuce on a bread and put the tuna salad on top. Variation tip: Add some grated cheese to the tuna salad or some tomato slices on the bread. Needed some variation to the pasta's I often eat and I came up with this pasta. Just thought of what I liked in my mother's pasta Bolognese and made a healthier version! And as a bonus I used gluten free pasta which they sell at my local organic store. It's a wholegrain pasta made of brown rice but without milk, soya, gluten or egg. It fills you up just as good so it's perfect for variation and you don't feel bloated afterwards. Bake the minced chicken in 1 tbs olive oil with crushed garlic until done. Meanwhile chop all the vegetables. When the chicken is done put aside and in the same pan bake the vegetables in the other tablespoon olive oil. When the vegetables are done, add the minced chicken, the passata di pomodoro, tomato puree, oregano, dried basil & thyme and stir well! Season with salt & pepper to taste and make sure it is heated throughout. If the sauce is to thick, add a splash of water. Drain the pasta when done and put on your plate with the sauce on top. Serve with some cottage cheese (about 1 tbs per plate)! Tip: As you now I always make single person servings, but this pasta is perfect to store in your freezer. So I make this recipe and then store 3 portions in the freezer. Ideal for when I'm late out of the office, don't feel like cooking, or need to save a little bit of money that week. It's Friday, so I'm working from home and it was time for a new lunch recipe! Was inspired to make these delicious egg frittatas on Instagram. I follow a lot of people who have adopt, more or less, the same lifestyle as me and this is a great source of inspiration for me! These egg fritatas are perfect for lunch but you could also consider them for breakfast! Just chop the vegetables and mix all the ingredients (except the cherry tomatoes) together in a bowl. Grease the ramekins with butter or coconut oil (choose the one you prefer it's only to avoid the egg from sticking to the ramekin) and put the mixture in two small ramekins. They rise in the oven so don't fill them up to the edge! Put the ramekins in the oven and bake for 20-25 minutes or until they are browned at the top. Serve them with the cherry tomatoes on the side if your prefer. This dish has been on my 'to do list' for a while now but since it takes about 40 minutes I just didn't get to it. But today was the day and they were delicious so definitely worth your time! Heat up water in your kettle and preheat your oven to 180 degrees of Celsius. Cut the top of the paprika and remove the seeds. Boil them in a pan with enough boiling water until they are cooked al dente and let them drain in a colander when they are done. Mix in a large bowl the minced beef, finely chopped spring onion, the crushed garlic clove, pepper, cumin, sweet paprika powder, fresh parsley, 25 gr feta cheese and the olive oil. Stuff the paprika with the mixture and press down firmly (not to firmly or your paprika will break). Put the paprika in a baking dish, sprinkle over the rest of the feta cheese and the pine nuts and put the top back on the paprika. Add a splash of water to the bottom of the baking dish and bake the paprika for 30 minutes in your preheated oven. Meanwhile make the pesto and cook the pasta as directed on the package. After 30 minutes, put the paprika for 3 minutes under the grill in your oven. Tear up the lettuce, put on a plate, mix the pesto with the pasta and put on top of the lettuce and finish with some feta cheese. Get the paprika out of the oven, put next to your pesto pasta salad on your plate and dinner is ready! Yesterday my brother called me and asked if he could eat at my place tonight. Since he is just living on his own for about 2 week I thought he was just too lazy to cook dinner. But just discovered that the reason he wanted to eat here was, of course he missed his big sister, but he wanted to eat vegetables because apparently he doesn't eat vegetables or fruit at all! I asked him what he had in his refrigerator and he mentioned cherry tomatoes and cucumber and that was basically it. So I'm glad I could provide some vitamins although it's just one day. On the menu was a new noodle recipe which I thought of myself with chicken and bok choy. It turned out pretty good so here it is! Start with mixing the ingredients for the marinade. Then slice the chicken in small pieces and put in the bowl with marinade so everything is covered. Let it sit for 5-7 minutes. Heat up water in your kettle and chop the vegetables. Then cook the noodles as directed on the package. Put your wok on high heat and when heated up add the marinated chicken and cook for 3-4 minutes. Then add the onion and paprika. After about 2 minutes add the white part of the bok choy and finally 2 minutes later add the green part of the bok choy for another minute. Drain the noodles, put on a plate or in a bowl, and put the chicken and vegetables on top. I get a lot of questions on how I can afford to eat clean! Well at first it was very pricy which was partly due to the fact that I needed a lot (and I really mean a lot!!!) of new products in my pantry. But with time I learned to eat clean on a budget! However, you do need to realise that this lifestyle just is a little bit more expensive then a more unhealthy lifestyle. White bread is just cheaper compared to Spelt bread and a lot of canned foods are often on sale which you then can buy in bulk but this isn't as healthy as, for example, making your own pesto. Never (and I mean NEVER) go to the store hungry! If you do this you will be more inclined to buy items you don't really need (impulse shopping) or items you crave which are impuls decisions! So try to avoid this since supermarkets sell a lot of unhealthy items! Make a shopping list and stick to it! This will help you to plan your meals and planning helps you to seek new recipes so you can use some vegetables twice a week so you don't have to trow away any food! And most important stick to the meals you planned! Before you do your grocery shopping and meal prepping make sure that you check which items you have left in your refrigerator from that week and see whether you can use these that day for a (leftover) lunch or dinner! This will also keep you motivated to find and try out new recipes. Check the weekly advertising brochures for the items that are on sale in different stores in your area. It takes a little bit more time to do the groceries but by buying products on sale you will safe a lot of money! Products which I can freeze or store in my pantry I'll buy in bulk when it's on sale. But don't buy raw products in bulk as you might not finish it and not everything can be freezed. Also compare the regular prices at different stores in the neighborhood. It could maybe only be a couple of cents difference but if you count it all up this will help you save a lot of money. Make time for a pitstop at another grocery store if you can get a better deal there! Also check the prices at the local market, these could very possible be lower then at the supermarket! Try to do all your grocery shopping for the week at once! If you only go to the store once you can get everything you need! If you're going multiple times you will be more inclined to buy additional items which isn't good for your budget! Buy in bulk for items that have a long expiration date. For example, I always get my pumpkinseeds in the organic store and they have 3 sizes of bags, buy the biggest one! This is much cheaper on the long run. If you have some leftover pasta sauce, couscous, soup, lasagna etc. store it in the freezer! And make sure that every week you have one day in which you eat these leftovers. This will save a lot of money, it makes sure that you always have a healthy option and you don't have to trow away any food! Make things yourself! Items which are cheaper to make by yourself include: granola, raw food bars, jam, salad dressings (also much healthier because store boughts almost always contain sugar), pesto's and maybe even your own bread! Eat fruits and vegetables according to the season. The price of any given fruit or vegetable that is in season will be lower so this will really help your budget. A post about seasonal fruit and vegetables will come soon! Avoid getting foods and snacks (even if it are healthy snacks) when you're on your way for example at a gas station or railway station. A bottle of water in those stores is at minimun 2 euros! Think about how much you can safe if you just buy bottles at the supermarket for €0.30 cents a piece instead of a new bottle ever day! Avoid eating out at a restaurant but just invite friends over for dinner and split the costs equally. It's all about changing your priorities! Of course once a while it's fun to eat out, but don't do it as often as before! This is one of the best ways to make sure you stay on budget. In the summer, try to start your own 'garden' with home grown herbs and maybe some tomatoes or cucumbers! You can also do this in a smaller version on your balcony but the seeds are way less expensive then the products itself. Do your meal prepping! This not only helps you to stay on the healthy track but it also makes sure that you have a delicious option ready so you don't have to get anything at the railwaystation or on your way to work. This list is of things I focus on to save money. If you have any other helpfull tips please share! I'm trying out new recipes two times a week to keep myself challenged and of course to present delicious new recipes to you all! Today I made delicious spicy falafel wraps from scratch and there perfect and they are vegetarian! Heat up 1 tbs of olive oil in a frying pan and fry the onion and garlic over low heat for 5 minutes until softened. Meanwhile make the avocado: mash the avocado with a fork, add all other ingredients and mix together. Set aside with the avocado pit in the middle to avoid it getting brown. When the onion mixture is done, put in a bowl together with the chickpeas (don't forget to rinse and dry them!) and dried spices and mash together with a potato masher, fork or in your food processor until the chickpeas are broken down. Stir in the freshly chopped parsley, season with salt & pepper. Beat the egg and put into the mixture and squish it together with your hands. Mould the mixture in 6-8 balls, then flatten into patties. Heat up the remaining oil in the frying pan and fry the falafels on a medium heat for max 5 minutes each side until they are golden brown and firm. Serve them in a wrap (2-3 per wrap depending on their size) with the guacamole, tomato, cucumber, carrot juliene and lettuce. Time for another delicious sandwich! This time with ham. I almost never eat ham but once a while I make an exception and what better way to eat ham than combined with other delicious ingredients on a slice of bread! Very simple, just put the ingredients on top of the bread in the following order: cottage cheese (seasoned with pepper), cucumber, arugula, ham and the egg on top (seasoned with salt). Finally found a curry recipe that's quick and which I like! So here it is. Steam the cauliflower florets for 8-10 minutes or until soft. Meanwhile chop the onion and yellow paprika. Heat up 1 tbs of olive oil in your wok and bake the onion and paprika for about 3-4 minutes over medium heat. Then add the coconut milk, green curry paste and chicken stock cube and bring to a boil. Cut the fish in small cubes and add to the curry and leef to cook for about 5 minutes over medium heat. Then add the frozen peas and cauliflower florets and heat for another 3 minutes. Serve the rice with the curry on top. Up till now I only posted one smoothie recipe: the strawberry smoothie! So it was about time I posted another one. I had some leftover spinach and a lot of pears and bananas since these were on sale so I decided to put them all together in a smoothie after my workout and it was absolutely delicious!!! Didn't expect this at all because the idea of spinach in my smoothie just didn't seem right. But it was perfect! It's the perfect post workout smoothie due to the added quark, but if you want a dairy free version just omit it. You can also have it as breakfast! Just mix all the ingredients, expect for the ones on top, in your blender until smooth. If it's too thick just add some more water. Poor it into a glass, top with the linseeds, chia seeds, coconut grater, pumpkin seeds and crushed pecan and this delicious superb spinach smoothie is ready! Two weeks ago I decided it was time to start with supplements to make sure that I get all the vitamins, minerals and essential amino acids in my system. The reason is that the products we currently eat don't contain the same amount of nutritional value as 50 years ago. In a society in which we are more and more exposed to air pollution, pesticides, stress, medicins etc. the constant flow of essential nutrients is more important then ever! However, supplements are never a replacement for a healthy and variated nutrition! It is called supplements! The name itself says it all, they are ment to complement your nutrition! Especially since fruit and vegetables contain the necessary fibers, enzymes, flavanoids and phytonutrients. I decided to use the brand Solgar because these were advised to me and are tested as one of the best vitamin supplements out there and they are sugar and starch free! They are more expensive, but for the Dutchies, if you order them abroad in the United Stated it's much cheaper and you will pay about 40 euro including shipping costs instead of about 80 euros. Vitamins are essential for your body because they allow your body to perform some key processes! They are necessary to activate enzyms which are essential in the digestion process, but without vitamins these enzyms are useless. Additionally, vitamins make sure that your hormon levels remain stable, they strenghten your blood vessels, are essential for your brains and your central nerve system and help fight of a cold. They practically play a role in every process in your body! But the problem with vitamins is that your body isn't able to make vitamins, so we completely relay on our nutrition for the necessary levels of vitamins. Minerals are like vitamins essential for your body. Minerals support the activities of vitamins and they are also essential in the production of blood, bones and tissue. They foster the condition on your central nerve system, make sure that your body fluids are in the right composition and they play a role in our energy management and oxigen transport. Like this isn't enough they also help neutralise some harmfull substances which we ingest on a daily basis. The same as with vitamins, out bodies aren't equiped to make it's own minerals so we need to make sure that we get enough minerals in our system trough our nutrition. In short, supplements are a good substite to a healthy lifestyle. When you have enough vitamins and minerals in your system the processes in your body will be more efficient and it won't ask for nutrients which causes cravings and it will eventually lead to more energy which makes you feel vital! Will keep you guys updated on how I feel and if I notice any changes! Winter is coming in the Netherlands so it's time for soup! This tomato soup is simply delicious and relatively quick to make! Cut all the vegetables and garlic and heat up the olive oil in a pan add the vegetables and sauté until tender. Then add the canned tomatoes, salt, pepper, water, syrup, ginger, sweet paprika powder and dried herbs, bring to a boil and let it simmer for about 20 minutes on low heat. During these 20 minutes make the pesto. For directions go to the green pesto recipe. After 20 minutes puree the soup until smooth. Poor back into the pan and if necessary add some extra boiled water to dilute the soup. Serve with the pesto and some fresh basil leaves! I'm always looking for new recipes to incorporate quinoa in my weekly meals because it's a great source of complete proteins, a perfect source of multiple vitamins B, calcium, magnesium and iron, and on top of that it contains all eight essential amino acids. Because quinoa is a seed and not a grain it's gluten free! This makes it the perfect substitute for rice or couscous and now I found a great recipe for a vegetarian fried quinoa which is gluten and sugar free. It looks a little bit plain in the picture but the tastes are amazing! Start with boiling some water in your kettle and rinse the quinoa really well! Cook as directed on the package (mine needs 12 minutes), don't forget to stir once a while. Steam the cauliflower or broccoli florets until tender. Then mix the soy sauce, sesame seed paste, water and lime in a bowl and set aside. Heat up some olive oil and the crushed garlic in a hot wok and add the mushrooms. Cook until done. Then add the peas, cauliflower and sauce and coat evenly. When the quinoa is finished add to the work and stir through. Chop the spring onions. Put the fried quinoa on a plate and serve with sesame seeds and the spring onion. The previous posts of my mini-series to help you get started on your clean eating journey I informed you about cleaning out your pantry and about the healthy products that should be in your pantry. But I noticed that it could be a challenge to find the right items at your local supermarket! I do my grocery shopping at my local store and at a local organic store. Since products are more expensive at the organic store I try to buy as much of my groceries at the supermarket to save money, but make sure you check the labels! In this post I will provide you with a list of items which I get at the local supermarket every week or regularly. Keep in mind that some of these items are foods that are only available in the Netherlands and that they suit my taste and diet, so you may need to adjust something's to make it suitable for your preferences. In the "What's in my pantry and should be in yours" post you will find more items or items that aren't in this list because I don't eat them often or don't need them regulary and I have them in my pantry because I bought them on sale! I do my grocery shopping once a week and I always make sure that I make a list at home to avoid buying unhealthy foods and to make sure I have everything I need for my meals for that week. I always start by loading my cart with fresh fruits and vegetables! This could help you stay motivated to stick to only the healthy and nutritious products and you'll be less inclined to add items which don't belong in your cart. By looking into your cart an seeing all the beautiful colors from the fresh products you will be more motivated to stick to your clean eating journey! I will present a list with vegetables which I often buy but add any other vegetable to your shopping list which you like or need for a recipe! Keep in mind vary your vegetables! Cabbage-lettuce, spinach or Romaine - essential for my lunch salads! Organic tomatoes and cherry tomatoes: get any tomatoes you prefer! I always buy bananas and apples because I have them in my oatmeal and often in my yogurt in the morning and for me bananas are the perfect snack at 10-11 A.M.
Bananas! I eat one every day so can't do without them! To save money I buy only one or two other fruits which depends on what I'm craving at that moment, the season or on what's on sale! These fruits include: strawberries, blueberries, white grapes, kiwi, peaches, oranges or raspberries. Feel free to add any other fruit you like to the list or replace an item with another type of fruit! Just make sure you have some variation! I only buy bread at the organic store and suggest you do the same or make your own! It's much healthier! Spelt bread - Is my favorite and my body reacts really well to it. However, for some people the high amount of gluten in spelt products can lead to problems. So see what's best for you but make sure you only eat whole wheat breads! Gluten free pasta - Yes they do sell this at the organic store! I eat this once a week to vary with the Spelt/Kamut pasta. I buy the one made from brown rice but they also sell one which is based on corn! Noodles - I prefer the gluten and wheat free noodles because I eat Spelt products and don't want to ingest to many gluten. Chickpeas - Perfect for salads or as a snack. Yoghurt: I always get natural yoghurt and Greek yoghurt. Don't buy any flavored yoghurts because these contain lots of additional sugars and food additives. Just flavor with some fresh fruit yourself! Quark: perfect source for protein! Unsweetened almond milk: I generally but the unsweetened version because I like the taste better and it's healthier compared to the sweetened version which contains agave syrup! Eggs: can't live without eggs in stock! The egg yolks have some nutritional benefits but make sure you eat these in moderation! That's way my vegetable omelet contains only 1 complete egg and two egg whites! Fish: I eat fish at least two times a week so you will always find different kinds in my refrigerator/freezer such as (smoked) salmon, tuna, white fish etc. Most fish is considered to be clean, but make sure that you are aware of the high mercury content in most fish these days. You probably noticed that beef and pork are not on the list! On rare occasions I eat beef but never pork. I choose to eat lean meats like chicken. But if you do want ot buy beef I suggest you choose the leanest options possible. I stay away from pork completely because it's generally full of sodium and is high in fat. Pork is not considered clean, unless organic. Pine nuts - You can never go wrong with pine nuts! Perfect for in salads. During your journey you can add other types of nuts and seeds to your list and only buy new ones if you're running out! The same as for the nuts and seeds, start with a few basic items and then just add other oils and vinegars if you specifically need them for a recipe. For all dried spices I advise you to slowly start adding these to your collection based on the recipes you're making I will add a few dried spices to the list because I use these regurlaly. Other fresh herbs depend on the meals your making that week! At the supermarket these are a lot of unhealthy choices and desires in this aisle! So to avoid temptation and for the simple reason that they just don't sell any baking goods that fit clean eating I skip this aisle completely and buy everything at the organic store! Almond meal: only contains ground almonds and is a great low-carb option! But it does contain twice as much calories compared to regular or whole wheat meals. Coconut meal: Could be an alternative for almond meal, has the same benefits but is lower in calories. However, you can't simply replace almond meal with coconut meal because it's naturally dry and needs more liquids! Spelt flower - Or another whole wheat type of flower! I also make my pizza with this! Tea: I generally buy green tea but there are other healthy options like chamomile and chai tea. or try and make fresh ginger or mint tea! If you have any other suggestions, comments or questions feel free to leave a comment! A simple and quick breakfast recipe is organic yoghurt with mixed fruit. You can add any fruit you like! This recipe has the perfect balance between proteins, fats and carbohydrates. The unroasted and unsalted nuts in your homemade granola increase the protein levels of your breakfast making you less likely to get hungry soon! The nuts are also the perfect source for the essential fats stimulation you brain capacity! So it makes the perfect start for a day at the office. Cut all the fresh fruit and put in a bowl with the yoghurt and all other ingredients. Give it a stir and your breakfast is ready! Not so quick, not so simple, but DELICIOUS! So had to share with you all and really recommend you make this sometime in the weekend or on your day off! It's the perfect dish for me to eat some vegetables I don't eat that often and it sure fits the Fall and upcoming Winter. Recipe is based on the vegan cottage pie from Kenko Kitchen but I left out some ingredients to make it more affordable! Start with your filling. Chop the onion and garlic cloves and sauté in the olive oil. Meanwhile finely chop the carrots and celery. After a couple of minutes add the chopped carrot and celery to the pan and season with salt and pepper. Cook the mixture until the vegetables are tender (test with a fork). Then add the tin of tomatoes, bay lead, lentils and the chopped herbs to the mixture and leaf to simmer for about 10 minutes and everything in warmed through. After 10 minutes make sure to taste your seasoning and add some more salt and/or pepper if needed. When your filling is shimmering, slice the sweet potato (with skin on!) and the cauliflower into smaller pieces and steam the sweet potato for about 6-8 minutes and the cauliflower for 10-12 minutes (both need to be tender, not to soft!). During the steaming of the vegetables, wash and chop the leek and sauté with 1 crushed garlic clove and the dried parsley in a small frying pan until translucent in colour. Once the leeks are translucent and the cauliflower is steamed put both in a blender or your food processor and pulse until just mashed with a splash of coconut cream. In a seperate bowl mash the sweet potato by hand and then add it to the food processor and pulse the mixture of leek, cauliflower and sweet potato until combined. When the mixture seems to dry just add another splash of coconut cream and season with salt and pepper. MIx in the agave syrup and set aside. Then first put the filling (lentil-tomato mixture) into 6 small ramekins (or one big pie dish).Top with the mash mixture and put a sprig of fresh thyme on top of each ramekin. Bake in the oven for about 35 minutes on 180 degrees op Celsius. Variation tip: After 30 minutes in the oven sprinkle some grated cheese on top of the pies and put back for the last 5 minutes. When you’re finished with cleaning out your pantry all the products that are gone need to be replaced with new healthy ones (see clean out your pantry)! So in this post I will give an overview of all the products I have in my pantry. Of course buying all these products at once is very costly and that’s also not what I did, start with some of the items and then slowly expend your pantry! This weekend I will also post a shopping list for beginners to help you get started on your clean eating journey! For some products I mention the brand I use for my Dutch readers! I will do most of the explaining for the type of carbohydrates that don’t come from vegetables. For the other products less explanation is necessary but if you have any questions don’t hesitate to leave a comment or send me an email. Carbohydrates from starches, grains and legumes are the fuel for your body. Carbohydrates can be classified into simple and complex carbohydrates. Simple carbohydrates are the wrong kind and are found in processed food products like white rice, white pasta, white bread, cookies, cake etc. Complex carbohydrates can be found in whole wheat products, brown rice, quinoa, rye, buckwheat, spelt but also in legumes and of course vegetables. It’s an important group in your pantry! Overall make sure that you have a variation of carbohydrates in your pantry and also some gluten free products like quinoa and oats. Spelt Pasta – For me spelt products work really well but for some people it can lead to a bloated feeling or diarree so when you start eating spelt see what it does with your body! If your intestines are irritated by it then it would probably be better to eat kamut pasta or whole wheat pasta. If your body reacts well to spelt you need to make sure that you don’t eat it all the time because it contains high levels of gluten. On the other hand the glycemic index is relatively low so it will supply you with energy for a long time. Spelt products can be bought at your local organic store (Ekoplaza, Heerlijk) and you just have to see which product you like most! I always have spaghetti, penne and spirals and whole grain/spelt lasagna sheets. Kamut pasta – Kamut is another ‘old’ grain like spelt and I really like to switch between these two. Also only sold in organic stores. Kamut is more expensive then spelt so if you just starting with clean eating I would advise you try out spelt first. Gluten free brown rice spaghetti - Perfect alternative for pasta. They sell it at Heerlijk and tastes great with a red pesto! Quinoa – Is definitely a favorite of mine. You can serve it as a hot dish but it’s also perfect for cold dishes and trough salads. And it’s gluten free! You can also get quinoa flakes which you can use in your homemade granola. Oats – My favorite breakfast! If you buy oats for breakfast keep in mind that only oat-flakes are glutenfree. I also buy it at my local organic store (Heerlijk, merk: de Halm; Ekoplaza, huismerk) but you can also buy it at most supermarkets but then make sure you check the ingredients to see if there is no added sugar! Brown rice – Is so much better for you then white rice! The best is organic brown rice but I like brown basmati rice the most. I buy the brown basmati rice from Ekoplaza because this one has a cooking time of 20 minutes. Other Brown Basmati Rice with a round grain are a little bit better, but this takes 45 minutes to cook and after work I just don’t have the time. Rice crackers – Perfect healthy snack for me! I vary with quinoa rice crackers, spelt rice crackers and normal ones. I buy these from the brand LIMA at Ekoplaza or Heerlijk. Spelt couscous – I really like couscous and found a spelt couscous from the brand BIA (couscous di Farro) at Heerlijk which is cheaper than normal couscous and it fills me up quicker! Gluten & wheat free brown rice, pumpkin & ginger noodles – These are delicious and I never use any other noodles. I buy them at Heerlijk, 250 gr per package, good for 3 meals from the Brand Terrasana and they sell them in most organic stores. From the same brand they also sell buckwheat noodles. I don’t like the taste of buckwheat but if you do these are perfect! Rye bread – to have some variation I sometimes eat rye bread. You can buy this in any store but again whatch the ingredients! Chickpeas – Very handy to use trough salads or as a healthy snack. Other products that would complete your pantry but aren’t my favorites are: black beans, kidney beans, buckwheat products, millet, whole wheat/grain pasta and amaranth. Unsweetened Almond Milk - You will always find this in my fridge. I use it in cooking/baking or just with my favorite oatmeal. If you drink coffee I would also recommend using almond milk, but keep in mind that it has a rather mild flavor so you could also use coconut milk. Coconut milk – Ideal for cooking and baking! It has a delicious taste! Parmesan cheese or Pecorino – Pecorino is diary free! Butter – If you use butter I would recommend u use organic real butter and definitely not margarine! Natural yoghurt and Greek yoghurt – also not 100% clean but when combined with some nuts and seeds the ratio fats and proteins are right and I like to have it as a variation for my breakfast and my body reacts well to it! If you do have irritated intestines or feel bloated and you eat yoghurt or other dairy products these could be the cause! Perfect to season your dishes! I always have the following list of herbs. So it is a long list, but still I probably forgot somethings. If you mis an item please leave a comment so others could read it! Coming soon: beginners shopping list to help create your healthy pantry! I love having pasta for dinner on days that I workout! As you know my all time favorite is my Red pesto pasta. But I also make a delicious green pesto pasta! Cook the pasta as directed on the package and make the Pesto ala Genovese if you haven't already done this during your meal prepping! Cut the chicken into small pieces. Heat up 1 tbs olive oil and 1 crushed garlic clove in a fry pan, season the chicken with salt and pepper and bake until golden brown. Cut the mushrooms, onion and zucchini and add them to the fry pan when the chicken is halfway trough. Don't forget to season the zucchini with some salt and pepper. Put a handful of arugula on your plate. Mix the pesto through the pasta when done, add the vegetables and chicken to the pasta pan, give it a stir and put on top of the arugula. Slice the cherry tomatoes and sprinkle them over the pasta with some pine nuts and parmesan cheese. Time for another delicious lunch salad! This time with mackerel! I used leftover vegetables from my refrigerator and it turned out pretty good! A little bit of Summer on your plate since Fall has officially started in the Netherlands! If you haven't already done this during your meal prepping boil an egg and roast the pine nuts. Put the salad and arugula on your plate. Chop the tomatoes, cucumber, radishes and egg and put it on the salad. Sprinkle with the dressing and pine nuts and this nourishing lunch salad is ready to be eaten! When I started with my healthy and clean eating lifestyle my focus wasn’t that much on eating clean but just on eating healthy. I was trying to avoid products like white bread, white pasta etc., fatty and high-calorie foods and foods that contain lots of sugar. And I can really recommend for you to do the same! By taking small steps instead of changing drastically you and your body gets used to the healthier foods and lifestyle and since you are allowed to have some cheats the change of relapsing is smaller. But when I noticed that eating healthy suited me and my lifestyle (in which I already worked out for 2-3 times a week) so much better I started to learn more about the type of foods and really expanded my knowledge about food and the nutritional value of different products. So automatically I learned more about the do’s and don’ts of a clean eating lifestyle. So it’s important to realize that it isn’t just happening over night, but that it is a process which takes time and that’s okay! You learn more and more every day and I’m still learning! After increasing my knowledge on healthy foods and clean eating I took the time to read the ingredients to each of the items in my pantry. This was really an eye-opener and it will give a great overview of what you have been eating. Even products of which I thought that they were healthy actually contained high amounts of sugar and saturated fats. Additionally, I found lots of ingredients that I didn’t know or that I could not pronounce and lots of food additives (for the Dutchies: E-nummers). So, take a look in your pantry and I’m sure that you also have some items like this lying around! This is the result of the modern world we live in. Stores sell lots of produced foods which are easy for us to take home and eat whilst not paying attention to what made and is in those cookies and why the expiration date isn’t till one year later? Whilst when you make your own cookies they will be good for max one week. Are you ready to adopt a clean eating lifestyle? Start by cleaning out your pantry by reading the ingredients. Make a pile with foods that do not suit your new found lifestyle and a pile that do. This second pile goes right back into your pantry. But what to do with the first pile of items that aren’t that suitable? You can drastically toss the food out. But who can afford that? You spend money on it and maybe others who don’t eat clean can use them. So you can donate them to friends, families or neighbors! In this way the food doesn’t get lost and you actually make others happy! Who doesn’t want to do that? But there will also be foods that you still want to consume and just don’t want to give away and hold on to. For those foods I would suggest that, of course, you don’t buy these anymore and that you slowly use these items week by week as a ‘cheat meal’ every Friday. Or you can host a dinner party for friends and use these items. In this way you have a lovely and fun evening and you can clean out your pantry at the same time! For baking products that do not fit clean eating you can still use it and bake something delicious and then take it with you to work as a little treat for you and your colleagues during coffee break. I’m sure they will appreciate it! I myself decided to give most of the products away and I invited some friends and prepared my last meal with processed foods. So now your pantry is clean and it is time for the next step! In short, simply start off with finding some delicious healthy recipes and getting lots of fresh fruits, vegetables and lean meats like chicken, turkey and fish (all preferable organic). Keep an eye out for healthy items on sale like frozen vegetables and fruits to save money and by having these items in your freezer you will always have a healthy option! But, when you go to the store CHECK THE LABELS!! Make sure you are just getting the fruit and just the vegetables without additional sugar or food additives. But in the upcoming week I will also publish a post on what type of items are in my pantry right now (with, for the Dutchies, the brands I use since I get a lot of questions regarding type and brands) and additionally I will post a beginners shopping list to assist you all on your clean eating journey! So check the blog later this week if you’re interested! If you have any suggestions or questions don’t hesitate to leave a comment! Yes! Who would have thought? It exists! A healthy pizza! Made of spelt flower, so no processed white grain products. It still contains gluten, but this pizza is amazing and definitely one of my favorite Sunday meals! It takes some time, mostly waiting but it's worth it. Recipe is for 1 pizza! Mix in a large bowl the spelt flower with Himalayan sea salt. Stir in the yeast mixture and the olive oil and knead the dough for 5 to 8 minutes. Make sure your hands are covered in flower to avoid that the dough sticks to your hands. Cover the bowl with plastic film and leave the dough to rise in a warm place for 30-35 minutes. Meanwhile, preheat your oven to 200 degrees of Celsius. Spread over the tomato paste with the back of a spoon. Sprinkle with oregano. Then put the sliced chicken breast and tomato on top and cover with grated cheese. Put in the oven for 10 minutes. After 10 minutes get the pizza out of the oven. Break the egg in the middle and put it back for another 10 minutes. When your delicious pizza is done spread over the arugula and sliced cherry tomatoes and your pizza is ready! The basis of a healthy lifestyle is eating enough vegetables. Another aspect that people often forget is that it's important to have enough variation in the vegetables you use. If you ask yourself the question: 'Do I have a varied diet?' then you will probably say 'Yes, I have!'. But when you write down which vegetables you eat every week you will probably write down more or less the same vegetables. When anybody takes a look in my refrigerator at any week they will always find sweet paprika's, cucumber, zucchini, salad, arugula, (cherry) tomatoes, onions and mushrooms. I love these vegetables so I eat them a lot! And since I'm living alone and I don't like to waste any food I need to use these in different meals. But when I get only these vegetables every week that's definitely not a varied menu! In order to avoid buying more or less the same vegetables every week I agreed with myself that every week I need to buy a vegetable that I've never used or tasted before. When I just started eating clean this really helped me to discover new tastes and new recipes and I learned a lot! But now I find myself at a point that I tried (almost) every vegetable available in the store or on the market so I needed a new trick. There are a lot of vegetables I do not really eat that often for no apparent reason (like broccoli, beet root, cauliflower, egg plant, carrots, pumpkin, leek etc). In order to avoid that I don't eat these vegetables at all I now need to incorporate two of these vegetables every week into my menu plan and not the same vegetable of these two weeks in a row. This really works for me and it makes sure that I have variation in the vegetables I eat. Of course, every week I eat paprika's, zucchini and mushrooms. But this isn't a problem due to the fact that I add some of my less desirable vegetables to my menu every week. So be aware of the choices you make when it comes to vegetables and make sure you have enough variation!